The Chinese do not plan to live in a world dominated by the U.S. dollar for much longer. Chinese leaders have been calling for the U.S. dollar to be replaced as the primary global reserve currency for a long time, but up until now they have never been very specific about what they would put in place of it. Many have assumed that the Chinese simply wanted some new international currency to be created. But what if that is not what the Chinese had in mind? What if they have always wanted their own currency to become the single most dominant currency on the entire planet? What you are about to see is rather startling, but it shouldn’t be a surprise. When it comes to economics and finance, the Chinese have always been playing chess while the western world has been playing checkers. Sadly, we have gotten to the point where checkmate is on the horizon. When I arrived to Bangkok the other day, coming down the motorway from the airport I saw a huge billboard—and it floored me. Given that the Bank of China is more than 70% owned by the government of the People’s Republic of China, I find this very significant. It means that China is literally advertising its currency overseas, and it’s making sure that everyone landing at one of the world’s busiest airports sees it. They know that the future belongs to them and they’re flaunting it. Everyone knows that China is rising. And most everyone has assumed that Chinese currency would soon play a larger role in international trade. The tightly controlled Chinese yuan will eventually supersede the dollar as the top international reserve currency, according to a new poll of institutional investors. The survey of 200 institutional investors – 100 headquartered in mainland China and 100 outside of it – published by State Street and the Economist Intelligence Unit on Thursday found 53 percent of investors think the renminbi will surpass the U.S. dollar as the world’s major reserve currency. Optimism was higher within China, where 62 percent said they saw a redback world on the horizon, compared with 43 percent outside China. And without a doubt we are starting to see the beginnings of a significant shift. China’s yuan broke into the top five as a world payment currency in November, overtaking the Canadian dollar and the Australian dollar, global transaction services organization SWIFT said on Wednesday. The U.S. dollar won’t be replaced overnight, but things are changing. Of course the truth is that the Chinese have been preparing for this for a very long time. The Chinese refuse to tell the rest of the world exactly how much gold they have, but everyone knows that they have been accumulating enormous amounts of it. And even if they don’t explicitly back the renminbi with gold, the massive gold reserves that China is accumulating will still give the rest of the planet a great deal of confidence in Chinese currency. Meanwhile, the Chinese have also been accumulating a tremendous amount of U.S. debt. At this point, the Chinese own approximately 1.3 trillion dollars worth of our debt, and that gives them a lot of power over our currency and over our financial system. Someday if the Chinese wanted to undermine confidence in the U.S. dollar and in the U.S. financial system, they have a lot of ammunition at their disposal. On a purchasing power basis, the size of the Chinese economy has already surpassed the size of the U.S. economy. We are only two months into 2015, and it has already proven to be the most volatile year for the economic environment since 2008-2009. We have seen oil markets collapsing by about 50 percent in the span of a few months (just as the Federal Reserve announced the end of QE3, indicating fiat money was used to hide falling demand), the Baltic Dry Index losing 30 percent since the beginning of the year, the Swiss currency surprise, the Greeks threatening EU exit (and now Greek citizens threatening violent protests with the new four-month can-kicking deal), and the effects of the nine-month-long West Coast port strike not yet quantified. This is not just a fleeting expression of a negative first quarter; it is a sign of things to come. The euro last stood at $1.1072, off 0.90 percent for the day and below a key support level, Sutton said. It fell to as little as $1.1066, which was the lowest level for the euro against the dollar since September 2003, according to Thomson Reuters data. The euro also declined to one-month lows against the Japanese yen, which was flat against the dollar at 119.72 yen to the dollar. As the U.S. and Europe continue to struggle, China is going to want a significantly larger role on the global stage. 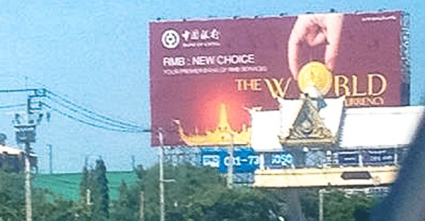 And as the billboard in Thailand suggests, they are more than willing to step up to the plate.